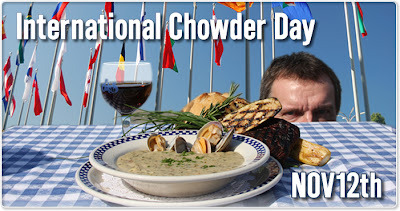 Quick on the heels of his latest giveaway (9000 chocolate chip cookies, doled out in the two weeks prior to Halloween), Duke Moscrip plans to shower the people with “Award Winning Clam Chowder.” In honor of International Chowder Day (say, Duke, what other nations are involved?) Chowder House crews will be dishing out 1,000 complimentary cups of chowder on Thursday, November 12 “all day, all night at all six Duke’s locations” — while supplies last. Armed with the knowledge that there’s no such thing as a free lunch, I shot Duke an e-mail and asked, so what’s the catch? Don’t hide! Come out and get some chowder, says Duke. “This is a no strings attached offer,” he responded, before explaining that patrons do have to come in and sit down (no chowder to-go) and the promo does not extend to his other chowders (I’d probably go for the Dungeness crab and bourbon chowder if I were buying). “If [you] order other things, great. If not, no big deal,” Duke said. The offer was originally extended to his e-mail club members — a list an astonishing 155,000 strong, but if you don’t have a computer, or if you’re on enough e-mail lists without joining Duke’s, he promises the promotion’s still good. Anyway, with the miserable weather we’ve been enjoying this week, a cup of something hot and fragrant sounds pretty good to me. And speaking of which, seeing as I’m working from home and it’s lunchtime, I think I’ll go fix myself some of last night’s leftovers. 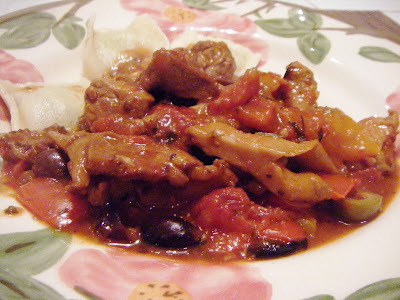 Veal stew with sweet peppers, olives and chanterelle mushrooms. Even better the next day!